The first step towards getting your garage door springs repaired or replaced is knowing which type you have. The two most common types are extension and torsion springs. Both are designed for different types of doors, and work very differently. Understanding the ones you have and how they work will help you avoid a lot of problems later on. Extension springs are usually attached to the sides of the door and extend when the panels lower to create tension which they later use to contract and bring the door back up. 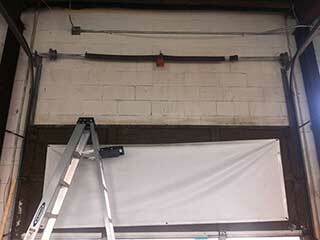 They’re relatively easy to install and are a popular choice for standard overhead garage door systems. Torsion units incorporate are attached to the top of the door, and they are installed across a horizontal shaft. Torsion springs don't contract or expand when the door moves. Instead, the twist and unwind, using torque rather than contraction in order to promote the movement of the panels. They are suitable for heavier doors due to their enhanced durability and flexibility. The springs work hard to lift and lower your garage door, and over time they become prone to wear. This means that you will eventually need to replace them, but regular inspection, lubrication, and the occasional tension adjustment can help stave off the effects of rust and gradual wear and tear. Be aware, though, that the damage can take the form of hairline cracks and fractures that will not be visible to the naked eye. That's why it's always preferable that you have these components serviced by a professional, rather than try and handle them yourself. Spring replacement is a dangerous task, and it can present a real risk to you and anyone standing close by. The high amount of tension involved in performing this type of job means that any wrong move and these tightly wound or stretched coils can break and go flying. We strongly recommend you call our expert technicians to complete the task safely and without risk of injury or further damage to other parts of the system. Our specialists at Garage Door Repair Glendora are the local experts you should call for all your spring related needs. We also offer a regular maintenance service that can keep these components functioning safely and smoothly for years to come. Give us a call today and let us know how we can help you today.